Just in time for today’s beginning of Google’s Basecamp user meeting (an “unconference” in their words), Google released the eighth iteration of SketchUp, their hugely popular 3D modeling application. The following features integrate already existing Google data and services closer into SketchUp. This will aid nicely in creating and refining geo-located buildings. Solid Tools – Although it should be noted that SketchUp does not include “solids” in a classic CAD sense now (it is still “only” a surface modeler), this set of tools adds a variety of boolean operations (union, subtract, intersect etc.) to the SketchUp toolset. The only downside: while this is an exciting addition, it is only available for Pro users. A feature that should make users happy is that now toolbar locations can be saved and restored. This does not fix the nagging toolbar reshuffling that happens occasionally but it offers a fix for when it happens. Outer Shell – This feature discards all internal geometry of a shape. It will be very useful for reducing geometry for geo-modeling (and Google Earth upload) as well as 3D printing. 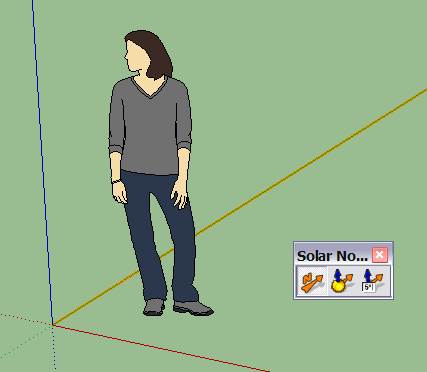 A new toolbar to facilitate setting the north angle (the image also shows the new “face” of version 8: Susan! Updated DWG/DXF 2010 import/export – Another Pro-only feature (remember that this was removed from the free version with the 7.1 release). Calculate volumes – This comes with the new solid (“manifold geometry”) tools. Should be useful for calculating concrete volume etc. The SketchUp Ruby API got enhanced with several new methods that deal with the new manifold geometry (“solid”) tools. It should also be noted that the Ruby engine that drives many plugins got updated. More on that should be on this page soon. You can watch a short video overview of the new tools below. There is also a nice, official blog post and a website (and some release notes – and even more) to read through. Although there are lots of great new features, I am still missing others that would have justified the new major release number (8 as opposed to 7.2) a little better. My personal favorite would have been a better way to deal with plugins. The extension capability through Ruby plugins is such a major feature of SketchUp (especially given many recent, powerful plugins) that a better plugin management – including a version-checking and updating function – would have provided a useful, broadly-aimed feature. After all, this idea was rated second-highest on last year’s product ideas list. Leaving my pet-peeve request aside, release #8 delivers quite a few interesting new features and improvements that offer something new and useful for every kind of user.